VISION : NCSWT is the leading non-profit organization of Thailand which promotes the development of social work and provides social welfare services to enhance the quality of life of all people and vulnerable group. On Friday, February 22, 2019, the delegates from Bangladesh National Social Welfare Council of the Ministry of Social Welfare together with Professors from Mahanakorn University of Technology visited National Council on Social Welfare of Thailand (NCSWT). Maj. Gen. Khunying Asanee Saovapap, Chair of Advisory Board, Prof.
On February 16-17, 2019, National Council on Social Welfare of Thailand (NCSWT) organized a Charity Rally, “NCSWT’s Family Rally 2019”, Bangkok - Khao Yai route, as fund raising program for contribution to United Way of Thailand. On Thursday, December 27, 2018 Mrs. Chanintorn Tada, Vice President and Ms. Ayumi Tada, Member, Hiroshima Japan-Thailand Friendship Association, presented a grant in the amount of 345,000 baht to Maj. Gen. Khunying Asanee Saovapap, Chair of NCSWT Advisory Board at the Meeting Room on 4th floor of NCSWT Office. The grant is for 2019 Scholarships for poor female students in secondary level in the North and Northeast provinces in Thailand. On Friday December 7, 2018, Mrs. Kanittha Dhevinpukdi, Board Member and Chair of Family Welfare and Social Welfare Services Committee, received a support fund in the amount of 35,000 baht from Mrs. Wipa Karnjanawat, Vice Chair, Foundation for Vocational Rehabilitation Center for the Disabled of Phra Pradaeng. On Sunday, November 11, 2018, National Council on Social Welfare of Thailand, National Council of Outstanding Mother under the Patronage of HRH Princess Soamsawali and Buddhists from Bangkok and various provinces jointly performed a religious ceremony. Maj. Gen. Khunying Asanee Saovapap, Chair of NCSWT Advisory Board and Chair of National Council of Outstanding Mother presided over the event and presented Kathin robes to the monks at the end of Buddhist Lent and offered cash donation in the amount of 1,641,934,25 baht to Wat Khun Poom in Bung na rai District, Phichit Province. On Sunday, November 18, 2018, Gen. Singha Saovapap, NCSWT President and Maj. Gen. Khunying Asanee Saovapap, Chair of Advisory Board and Chair of National Council of Outstanding Mother under the Patronage of HRH Princess Soamsawali, presided over the religious ceremony at Wat Weruwan in Maharaj District, Phra Nakhon Si Ayutthaya Province. On December 4, 2018, Maj. Gen. Khunying Asanee Saovapap, Chair of NCSWT Advisory Board and Chair, Free Meals for the Needy Committee and Pol. Lt Dr. Manus Nonuch, Vice President and Chair, Disaster Relief Committee, co-chaired the relief activity for urgent help of flood victims at Chumphon Province. On Saturday, November 24, 2018, Gen. Singha Saovapap, NCSWT President, presided over the opening ceremony of Charity Bowling Competition for fund raising and Certification presentation to sponsors of the competition at Blu-O Rhythm & Bowl, 5th Floor, Siam Paragon. On August 29, 2018, Professor Rapeepan Kumhom, Board Member and Chair of International Affairs Committee and Ms. Suchada Krispetchara, Secretary to International Affairs Committee, representing NCSWT participated in a meeting at the Vie Hotel, Bangkok. On August 29, 2018, Gen Singha Saovapap, NCSWT President, together with Maj. Gen. Khunying Asanee Saovapap, Chair of Advisory Board and Board Members presented a cash donation in the amount of 100,000 baht to relief the floods and landslides-devastated victims in many area of western Japan. The donation was presented to Rev. Akizumi Suzuki, President of Hiroshima Japan-Thailand Friendship Association, and Mrs. Chanintorn Tada, Vice President of the Association, at the Office of National Council on Social Welfare of Thailand. On Wednesday, June 27, 2018, Rev. 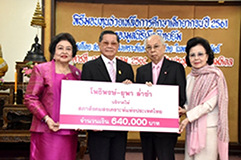 Akizumi Suzuki, President of Hiroshima Japan – Thailand Friendship Association and the delegations donated cash in the amount of 345,000 baht to Gen. Singha Saovapan, President of National Council on Social Welfare of Thailand. The presentation of the donation took place at China Place restaurant. The fund is for 2019 scholarships for female students in secondary level of low income families. Gen. Singha Saovapap, NCSWT President, Maj. Gen. Khunging Asanee Saovapap, Chair of Advisory Board, Pol. Lt. Dr. Manus Nonuch, Vice President and Mr. Supavat Poovakul, Chair of Regional Coordinating Committee, Region 9 hosted a Reception Dinner for Rev. Suzuki and the delegates at the Kantoke Cultural Center of Chiang Mai on June 25, 2018. The reception was for the occasion of their visiting to Thailand and homes of students in Chiang Rai Province. Rev. Akizumi Suzuki and 7 delegates from the Hiroshima Japan –Thailand Friendship Association visiting Thailand during June 22-28, 2018, to follow up on scholarship students in Chiang Rai and Phayao Provinces. NCSWT Vice President welcomed the delegation. On Saturday April 21, 2018, Gen. Singha Saovapap, President of the National Council on Social Welfare of Thailand (NCSWT) and Chair of United Way of Thailand, presided over the Horse Racing for Charity at the Royal Bangkok Sports Club. On March 30th, 2018, Mrs. Penpuck Srithong, NCSWT Secretary-General and Chair, Jasmine Production & Distribution Section, made a trip to visit a housewives group in Suphan Buri province. They are producing jasmine flowers and assemble them into small bouquet production of 10 baht each for 2018 National Mother’s Day. The Department of Social Development and Welfare in the Ministry of Social Development and Human Security together with social work network from public and private sectors, locally and internationally, organized the 10th Annual social welfare and social work conference, 2nd Social Work Day Conference for Asia –Pacific, with the theme of “Promoting Community and Environment Sustainability”, to honor the World Social Day 2018. The National Council on Social Welfare of Thailand (NCSWT) participated and supported the dialogue to share and exchange ideas to develop collaboration on social work and development for preparatory meeting of the Annual Social Welfare and Social Work Conference 2018 in commemoration of the World Social Work Day. On February 23, 2018, Miss Onnicha Pakpises, Chairperson of NCSWT Regional Coordinating Committee together with Miss Wipha Chinda, Managing Director of Praxair Co. (Thailand) presided over the Voluntary Activity Day for Huai Yai School Improvement project for Huai Yai elementary school in Banglamong District, Chonburi province. On Saturday March 3rd, 2018 Gen. Singha Saovapap, NCSWT President and Maj. Gen. Khunying Asanee Saovapap, Chair of NCSWT Advisory Board, together with Board of Directors received donation in the amount of 460,000 baht. On September21, 2017, at the Auditorium on 7th Floor of Education Division Building in The Royal Thai Army Nursing College on Rajvithi Road, Bangkok, Maj. Gen. Khunying Asanee Saovapap, President of NCSWT Advisory Board, presented 2017 Full Scholarships to 2 nursing students. On Friday, September 8th 2017, at 10:30 a.m., The National Council on Social Welfare of Thailand (NCSWT) together with Tokio Marine Insurance (Thailand) PCL (TMITH) and Tokia Marine Life Insurance (Thailand) PCL (TMLTH) organized the 2017 Scholarship Presentation Program to 65 students in high school and university level. The scholarships in the amount of 697,450 baht were jointly presented by Gen.
Rev. Akizumi Suzuki, President of Hiroshima Japan-Thailand Friendship Association and Mrs. Chanintorn Tada, Vice President, presented a grant in the amount of 460,000 baht to Gen. Singha Saovapap, NCSWT President, on August 30th 2017 at the Meeting Room on 4th floor of NCSWT Office. The grant is for 2018 Scholarships for female students in secondary level in the North and Northeast provinces. On June 14, 2017, Rev. Akizumi Suzuki, President of Hiroshima Japan – Thailand Friendship Association and Vice President, Ms. Chanintorn tada congratulated elected President of National Council on Social Welfare of Thailand (NCSWT), Gen. Singha Saovapap, for 2017 – 2020. The happy event took place on 4th floor at NCSWT Office. Maj. Gen. Khunying Asanee Saovapap, retiring NCSWT President and Members of NCSWT Board joined in. On Sunday April 9, 2017, Maj. Gen. Khunying Asanee Saovapap, NCSWT President presided over the Special Horse Racing for Charity at the Royal Bangkok Sports Club for fund raising for United Way of Thailand. The sum of 204,664.50 baht was donated to United Way of Thailand. On February 23, 2017, Maj. Gen. Khunying Asanee Saovapap, NCSWT President together with Advisor Gen. Singha Saovapap and Board Members, presented a donation in cash in the amount of 100,000 baht to Mr. Montri Pakanond, Director of The Planned Parenthood Association of Thailand at the NCSWT Auditorium. The fund is allocated to support the project “Health care and Reproductive Health” for the disabled students at the school for the blind in Mae Sod, Chiang Rai Province. On Saturday February 11, 2017, Assist. Prof. Dr. Vajiraya Buasri, NCSWT Vice President, together with Board of Directors received donation in the amount of 644,000 baht from Rev. Akizumi Suzuki, President of Hiroshima Japan-Thailand Friendship Association, at the Twin Tower Hotel. The grant is allocated for 2017 scholarships for female students in secondary level in the North and Northeast provinces. On Tuesday February 14, 2017, NCSWT distributed gift-sets to students with disabilities at Sri Sangwan School and Prachabodee School on behalf of Edwards Lifesciences Co. All gift-sets were donated by Edwards Lifesciences participants from East Asia and South East Asia countries attending sales conference in Bangkok. They voluntarily prepared these gift sets during their break session in the conference. On February 14, 2017, Maj. Gen. Khunying Asanee Saovapap, NCSWT President together with Board Members received the donation in kind of 10,200 pieces of clothing from Ms. Dolnapa Tumwattana, Chief Marketing Officer of BGT Corporation Public Company Limited. The clothing worth of 1,375,117.50 baht is to be distributed to people affected by the flood in the Southern part of Thailand. Rev. Akizumi Suzuki, President of Hiroshima Japan-Thailand Friendship Association and Mrs. Chanintorn Tada, Vice President, presented a grant in the amount of 644,000 baht to Maj. Gen. Khunying Asanee Saovapap, NCSWT President, on February 3rd 2017 at the Meeting Hall on 4th floor of NCSWT Office. On Thursday January 26, 2017, at 10:00 am, the JICA survey team from Tepia Corporation Japan, Tess Co.,Ltd. and Re:terra Co. Ltd., met with Maj. Gen. Khunying Asanee Saovapap, NCSWT President and board on the 4th floor meeting room at NCSWT Headquarters. The survey team requested NCSWT for assistance concerning the feasibility survey for installing rehabilitation program with pedal wheelchair in Thailand. Mr. Michael A. Mussallem, Chairman and Chief Executive Officer of Edwards Lifesciences invited Assist. Prof. Dr. Vajiraya Buasri, NCSWT Vice President, to thank NCSWT for taking part in volunteering activity project of the 500 participants of Edwards Lifesciences Japan & Asia-Pacific Sales Conference at the Royal Orchid Sheraton Hotel, on Tuesday January 23rd, 2017. On November 29, 2016, Maj. Gen. Khunying Asanee Saovapap, the NCSWT President, held candlelight in remembrance of the late King Bhumibol Adulyadej. Attendants formed Thai script number nine in front of Mahidol Building, NCSWT Office.